The Happy Cube puzzle game offers 101 challenges to explore with only 6 puzzles. For one player and more. Discover some challenges to create with 6 Happy Cubes. The possiblities are endless! Level 1 Explorer: make 2D and 3D cube puzzles with one colour. The blue cube is the most easy one, whereas the purple one is a tough row to hoe. 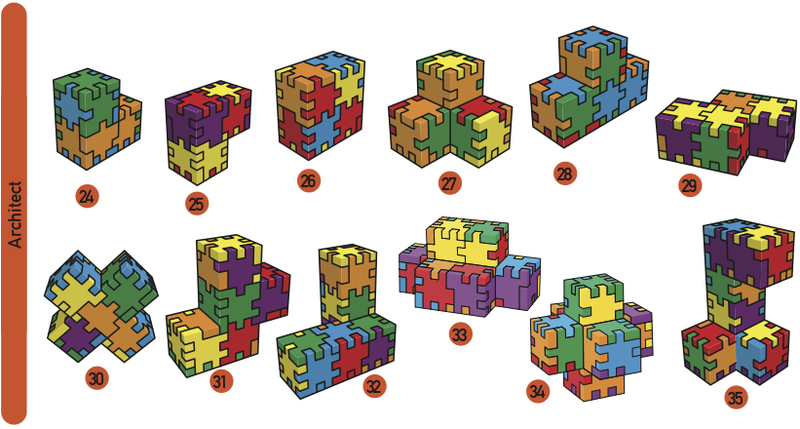 Level 2 Builder: simple 3D construction puzzles with several colours. Start combining 2 puzzles together to create a multi colour cube. Then try to combine 3, 4, 5 or colours to make multi colours cubes. A real builder takes it even one step further while combining 2, 3, 4, 5 or 6 colours in different sizes of beams. 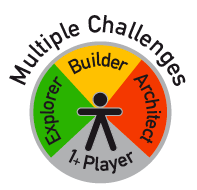 Level 3 Architect: advanced 3D construction puzzles with several colours. This is surely for die-hard puzzling fans. Architects combine 3, 4, 5 or 6 colours in impressive masterpieces. Use your wildest imagination and create a boot, dog or giraf. Send in a picture of your monuments through our puzzle club so that others can admire the result of your flexible brain ! 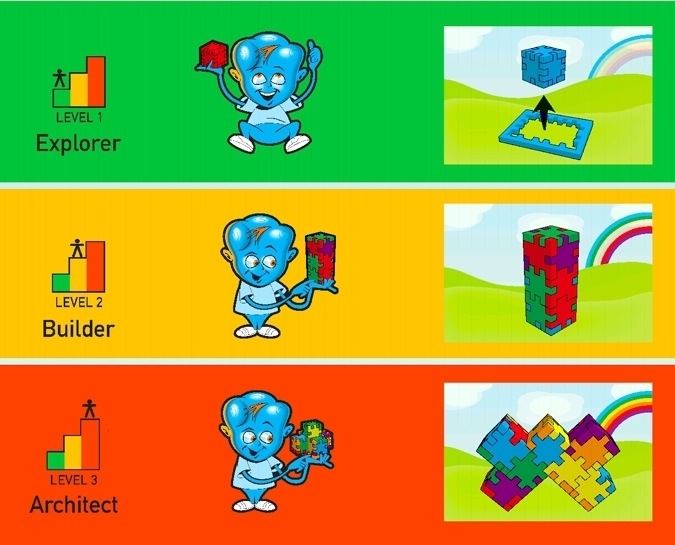 Level Engineer is the ultimate challenge: make combinations with the whole Happy Cube family. It is possible to combine Little Genius, Happy Cube, Profi Cube and Marble Cube together. Of course, there are some exceptions to discover: It is easy to combine Little Genius and Happy Cube. A combination between Profi Cube and Marble Cube is hard because of the irregular puzzle pieces.